It's easy to use the new SQL pivot operator to create your own multidimensional interface. MOLAP - Multidimensional online analytical processing describes the general theory of visualizing data in three dimensions. This has the primary goal of visualizing trends and signatures to enable the end-user to spot important changes. Pivot - A spreadsheet-like method for displaying aggregated data in matrix form. 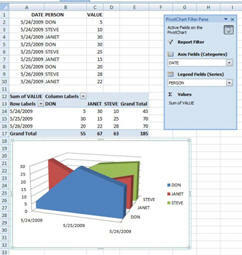 Examples include MS-Excel pivot tables and the Oracle 11g SQL pivot clause. To understand Oracle multidimensional databases quickly, take a few minutes to watch the MS-Excel help file on pivot tables. This explains the concepts behind Oracle MOLAP. 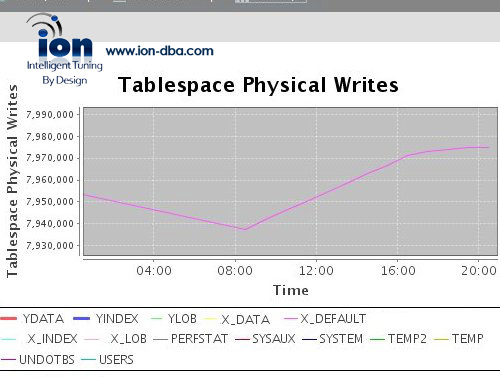 The ability to visualize Oracle data is critical for Oracle troubleshooting and tools like Ion for Oracle were created especially for this process. We'd get the same sort of results...diskreads and buffer gets by datafile by time. As long as we could support multiple bars per snap time, we've got the same chart. 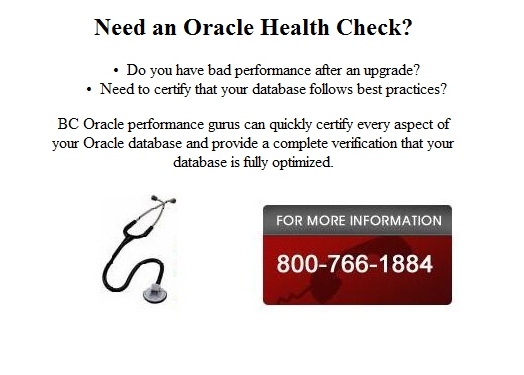 Pivot is not needed in this case (and in many cases) because Oracle already denormalizes the relevant columns. In cases where the data is normalized with name/value pairs (like in v$sysstat). As we see in this 2d chart, all we need to add is to put the tablespace_name on one axis and use the z axis for the time dimension. Let's take a closer look at our graphing options for 3d Oracle analysis. To create interactive 3d charts you need to start with an interactive screen that accepts the two dimensional parameters. The third dimension will always be TIME. Next, let's see how an Oracle enabled spreadsheet can be used to quickly query and extract Oracle data for trend analysis. Excel-DB is a MS-Excel plug-in that allows super-fast extraction of Oracle data into a spreadsheet using a super-fast API. The developer of Excel-DB explains how to do 3d charting with the Excel-DB tool:. What Excel-DB allows you to do is to couple the outcome of the query (the resultset, dynaset) to an Excel pivot table (you can even refresh it later by rerunning the query). Execute the SQL through Excel-DB's SQL dialog. A new dialog appears that asks where the output should be send to. Select: pivot table. 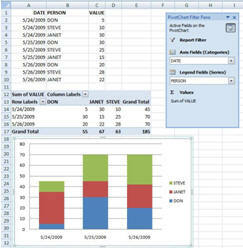 Excel will initially show a blank pivot table and a small window with the column names. You now need to drag the fields to their positions. Drag SECS to the middle of the table, TYPE to the page field, NAME to the top, hr and secs to the left. This will make a pivot table of the results. 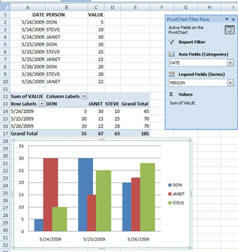 Use Excel to convert it to a pivot graph or create a new pivot graph using the data from this pivot table. The only technical requirement is that Excel-DB needs to connect using ADO to the database (oh, any database type in fact, not just Oracle). So, do not use the OO4O driver to connect when trying to use pivot tables. 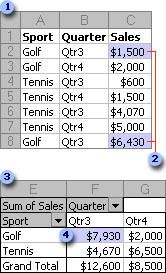 The nice thing of Excel's pivot tables are also that they are highly interactive. If you can get all interesting fields together it is just a matter of playing with the fields to show different 'slices' through the data. With Excel-DB there is no need for expensive multidimensional and OLAP tools. Simply extract your data with native SQL, and you are ready-to-go with robust OLAP analysis. 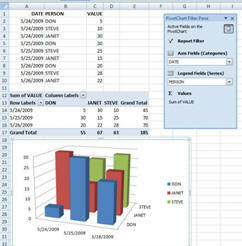 See talking video of Business Intelligence with Oracle Spreadsheets. Make sure to turn-up your speaker to hear the narrative. By download data directly from Oracle or SQL Server you can quickly use the Excel pivot table tool to create OLAP cubes for fast data analysis. Any Oracle data can be downloaded and cubed to provide a robust OLAP (ROLAP) solution for decision support and data analysis applications. 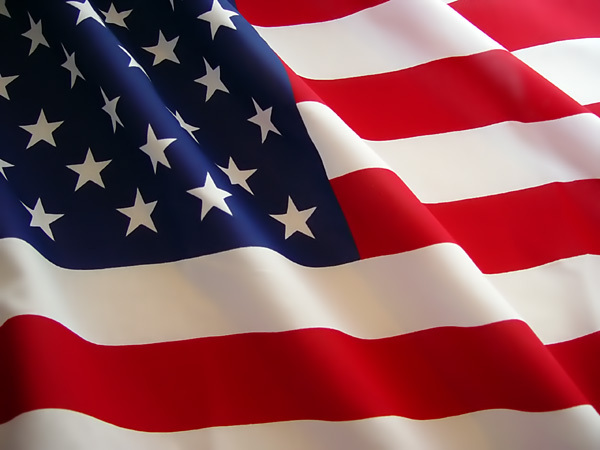 This alleviates the need to buy expensive Oracle OLAP tools such as the Oracle Business Intelligence (BI) plug-in, Hyperion or Cognos software. Get Oracle OLAP fast and easy with Excel-DB, the preferred method for Oracle spreadsheet advanced analytics. Now that we see how to do visualization in a spreadsheet, let's look at how an application front-end can be used to visualize performance issues.